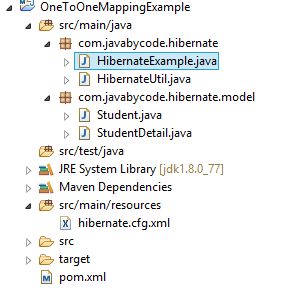 The Hibernate One-To-One Mapping Example using Annotation tutorial show you how to use Hibernate One-To-One Unidirectional Shared primary key mapping. With One-To-One Unidirectional Shared primary key mapping, two tables share the same primary key. In this Hibernate One-To-One Mapping Example using Annotation tutorial, we are discussing an example of a one-to-one association with a Student entity that references one StudentDetail entity. The StudentDetail does not reference back to the Student so that the reference is said to be unidirectional, in one direction only. Model class Student and StudentDetail are simple POJO class. Here we are using class Student and StudentDetail with JPA annotations to map them to a database tables (these tables were created in above step). @OneToOne on studentDetail property of Student class indicates that there is a one-to-one association from Student to StudentDetail. @PrimaryKeyJoinColumn indicates that the primary key of the Student entity is used as a foreign key to the StudentDetail entity. Here we are using cascade = CascadeType.ALL. It means that StudentDetail entity can not exist without Student entity and StudentDetail entity will be update/delete on subsequent update/delete on Student entity. In the above program, we persist a Student early, so that id of that student is generated. Then we set the StudentDetail id with student id( it means that foreign key constraint be respected). Finally, the studentDetail property of Student is set by StudentDetail object and save Student. The Cascade attribute is used on studentDetail property of Student class so that Hibernate will save StudentDetail object automatically and we no need to save it explicitly. That’s it on the Hibernate One-To-One Mapping Example using Annotation tutorial.